Niels Weinhold, Ph.D., (left) and Leo Rasche, M.D., researchers with the UAMS Myeloma Institute, leading a team in a study of 51 myeloma patients, have discovered patients respond differently to treatment because cancer cells can vary depending on their location. 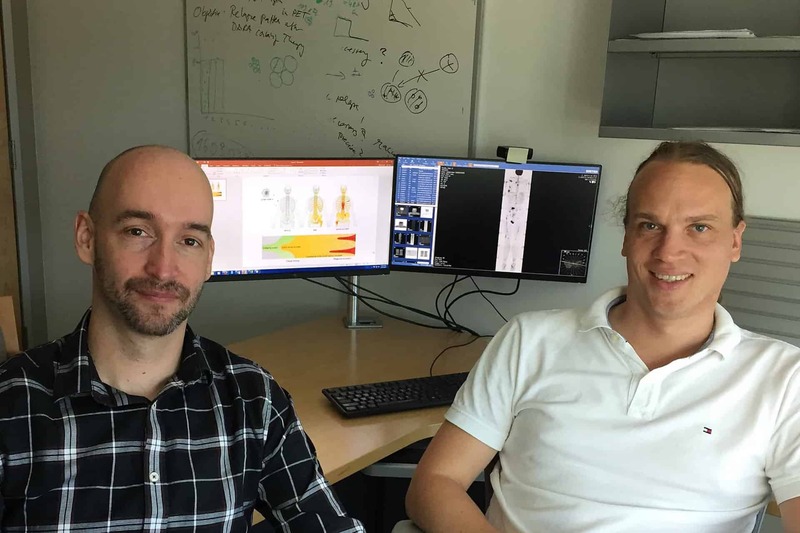 The team’s findings, which underscore the need to explore more than the standard biopsy site of the upper, outer edge of the pelvis, were recently published in an article in Nature Communications. Oct. 10, 2017 | Oct. 10, 2017 | Researchers with the Myeloma Institute at the University of Arkansas for Medical Sciences (UAMS) have identified one reason myeloma patients respond differently to treatment — the cancer cells can vary in type and intensity depending on where in the bone marrow they are located. The study highlights the need to investigate more than the standard biopsy site to obtain correct risk profiles. For the study, which included 51 patients, the researchers tested several areas of the cancer including specimens from both the pelvis and from so-called focal lesions, which are nodular plasma cell accumulations present in most myeloma patients and which are found through radiology. The authors, which include Rasche, Weinhold, the institute’s director Gareth Morgan, M.D., Ph.D., and the deputy director Faith E. Davies, M.D., showed that the most aggressive tumors frequently were only found in focal lesions. Weinhold is an assistant professor in the College of Medicine’s Department of Internal Medicine, where Morgan and Davies also serve as professors. “The genomic profiles of the abnormal plasma cells could be very different between the sites of focal lesions and the pelvis, but the pelvis is the standard site where biopsies are taken for diagnostics,” said Rasche. He added that the disease was not evenly distributed in the bone marrow but was instead a patchy disease with hotspots. Future research at the Myeloma Institute will investigate non-invasive techniques such as medical imaging or tests from the peripheral blood to better identify patients with aggressive tumors. Until then, suspicious focal lesions have to be biopsied.